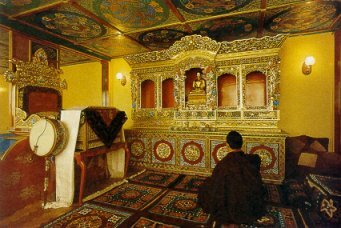 Death and dying is a popular topic in all Buddhist teachings, particularly Pure Land and Tibetan Buddhism. The Dalai Lama has said that his daily meditation involves preparation for death. Some Buddhists are encouraged to learn, analyze and even rehearse for the moment of death. 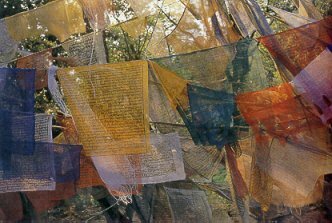 As stipulated in the famous text 'The Tibetan Book of the Dead', there are several scenarios for the dying process. The practitioners have to be mentally and emotionally prepared at the time of dying, in order to reincarnate to the higher and better realms in the next rebirth. The process of dying is an opportunity for spiritual liberation if one's mind is calm without any pain and clinging. It is described that the process of dying is divided into two stages, the outer dissolution of the sense powers and the inner dissolution of the mental states. In the first stages, the Four Elements made up of our body dissolve. Death is the separation of the mind (consciousness) from the body. This separation may take place over several hours or days. Generally, the body loses its ability to maintain consciousness gradually with each element of the body - earth, water, fire and air - losing its supportive ability in turn. When one feels that the body becomes heavier and weaker, the dissolution of earth element commences. The water element dissolves when the body fluid is out of control. The dissolution of fire element is associated with the loss of body warmth. Difficulty in breathing is an indication that the air element is going to dissolve. The inner dissolution begins with the manifestation of the 'ground luminosity' or 'clear light' [���I]. This is the revelation of one's own fundamental nature, which is also the fundamental nature of all phenomena. It is believed that one can be liberated right at this critical moment if one can recognize the clear light to be one's own mind-ground and unite with one's own life into a state of primordial purity. If one can recognize the clear light for what it really is, one will respond to it naturally as a child running into his mother's arms. If the clear light is not recognized, the mind enters the blackout state of Bardo. A temporal Bardo is a period of time, such as the period between sunset and sunrise. Bardos are the transitions of life, death and beyond, experienced by every being in Samsara, even insects. As outlined in The Tibetan Book of the Dead, there are six Bardos which span life, death and after death. In Tibetan Buddhism, the practitioner is encouraged to visualize all experiences in the Bardos after death as the projections of his own mind. But if he has not developed this ability in life, it will be almost impossible to do so when he dies. When ordinary people die, they are out of control. It is said that however difficult it seems to calm the mind during life, it is much more difficult at the time of death. However, it is said that for those advanced practitioners who have trained their minds well, each stage of dissolution process brings ever increasing clarity and insight. In Buddhism, the consciousness that continues from life to life is a subtle consciousness - the faculty of experiencing and being aware, the natural clarity of the mind. The fate of Bardo is largely determined by one's Karma, the effect of one's actions in past lives. To tackle the problem of death, one has to know all things as mere appearances to the mind, like illusions. One should become familiar with what to expect when they die, so that one can deal with these illusions instead of being overwhelmed and confused by them. First Bardo state - It is the period of unconsciousness, which may last for 3 to 4 days. Second Bardo state - In this state, consciousness awakens, it unfolds like a flower exhibiting its natural radiance, which is experienced as color, light and sound. This 'energy' then coheres to form a 'Mandala' of deities, like Bodhisattva, etc. Once again, if one can recognize that the mind perceives the deities and the deities themselves are fundamentally the same, then 'liberation' can occur. If the mind still does not recognize itself, the consciousness then enters the phantasmagoric Bardo of becoming. Third Bardo state- It is the phantasmagoric Bardo of becoming. Here the mind takes on a mental body in a dimension where thoughts literally form one's reality. In this Bardo, the mind has the power of all the senses of the physical body, but with the ability to pass through solid objects, etc. Yet, in the Bardo of becoming, one is still merely an automation, 'programmed' by one's Karma in the past lives. All kinds of visions and experiences that the Bardo has can only last up to 49 days. It is a Buddhist tradition to pray for the deceased during this period, hoping that the benefits of such practices would reach the deceased during this period. Phowa is a kind of meditation practice involving 'transforming' one's mind into an enlightened one, such as the popular Amitabha Buddha, at the moment of death. It is quite similar to that of the Pure Land sect. By invoking or reciting the name of Amitabha Buddha, one enters into a meditative state of merging one's mind with that of the Buddha or one visualizes the Buddha in front. One then repents and requests for a peaceful death that will benefit other beings. One will be purified by the light rays emitted by the Buddha. Finally, the dying person dissolves into light and merges with the essence of the enlightened Buddha. However, the full Phowa practice is a much more complicated ritual activity, which should be done only by a qualified master. A simplified version of this practice can be done for someone who is dying or even for a person who has already passed away. It can also be done for oneself.